When it comes the least-liked superheroes, it seems like a lot of people pinpoint Captain America. The common arguments are that he’s dull or too perfect… or that he represents a sort of chauvinist patriotism that’s off-putting. But Captain America might be the superhero I love the most, and the more I learn about him, the more I don’t believe any of those arguments against him are true. Sure, I believe strongly in “American” ideals like liberty, rights, and equality for all. I believe they make great ideals for a superhero, too. But tying those ideals so strictly to the United States via a “Captain America” is potentially alienating to anyone not-American. It comes across like jingoism. When Captain America was first created in the 1940’s, the United States was unified against a common enemy. 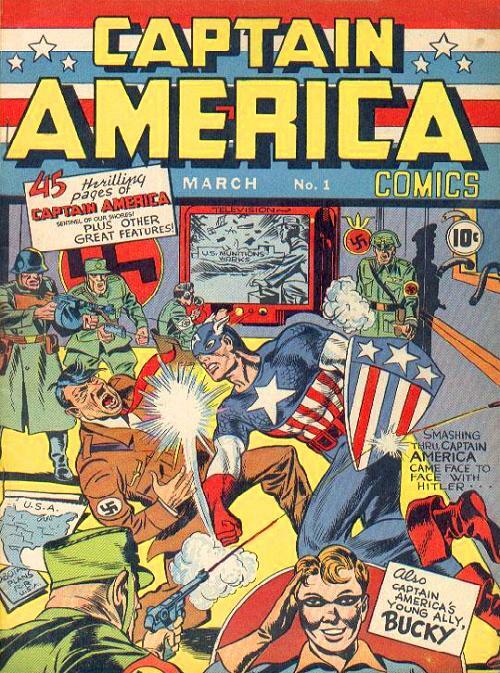 I mean, the very first issue shows Cap punching Adolf Hitler, which is something we can all get behind. But today, America lacks that unity, and the issues that matter to us are very different than they were in the 1940’s. That’s why modern writers have reshaped him to suit the times. A perfect example is in the Civil War comics, which depict Cap leading a group of superheroes who go underground while the government hunts them down. The U.S. passes a law forcing all heroes to register their real identities and work for them. Tony Stark, already famous as Iron Man, supports superheroes being on the government’s payroll, and Spidey takes off his mask for the first time in support of the act. But Steve Rogers believes in privacy and liberty for superheroes — and that pits him, the American icon, against the American government. If the definition of jingoism is “the extreme belief that your own country is always best, often shown in enthusiastic support for a war against another country,” Captain America’s actions in Civil War prove that he’s no jingoist. 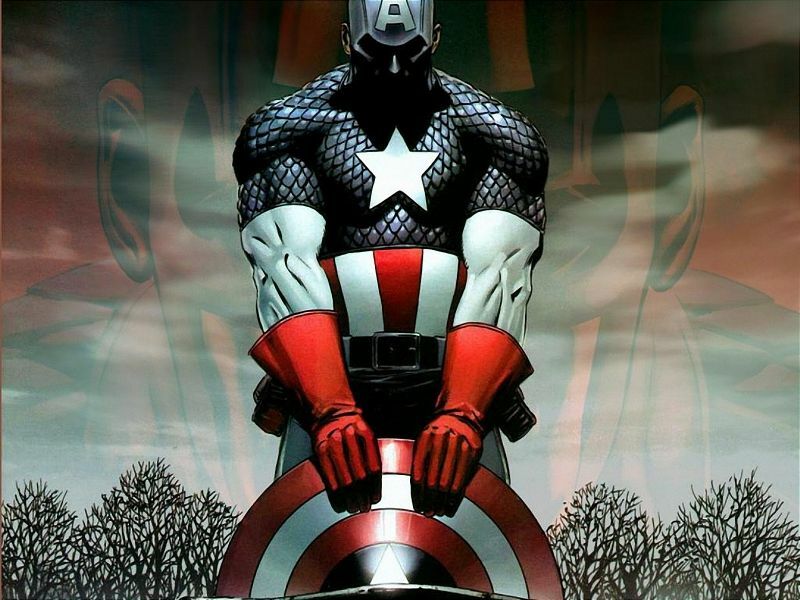 On a lesser scale, Cap also shows an affection for other countries, especially those that have fought for their ideals the way Americans did in World War II. When he visits Paris in The Winter Soldier arc, he remembers fighting alongside the French soldiers during the Nazi invasion and says that even though France may have surrendered, the French didn’t. On the flip side, he also often expresses frustration with his own countrymen’s views or unfounded prejudices. Cap is always making these kinds of distinctions. A man is not his country; a man is his ideals. He proves himself by his actions, and that’s the way Steve Rogers lives his life even before he becomes Captain America. His origin story is one of my favorites, because he isn’t born with superpowers, and he doesn’t have a big, tragic story that sparks his interest in fighting crime or saving the world. Instead, he’s just a good man who doesn’t like bullies. He wants to fight for his country during World War II, when the United States is standing up to the Nazis… but as the U.S. changes, his support for the government can change too. I love that he stands firm in his convictions even when it means disobeying the law. Is Cap Really Too Perfect? Cap can also be a Gary Stu (Mary Sue) character, and as such he can come across as a little too perfect, a little too always-right. Writers can use him as a way of presenting their idea of what is right in a way which, through the “perfect” Captain America, can come across as self-righteous. Like nobody can argue with it. I mean, when a character has the American stars and stripes on his armor and shield, he better not do something evil or it’s as if America is doing something evil, right? That may let writers get away with preaching, with Captain America as their mouthpiece. However, I haven’t found this to be a major problem yet. 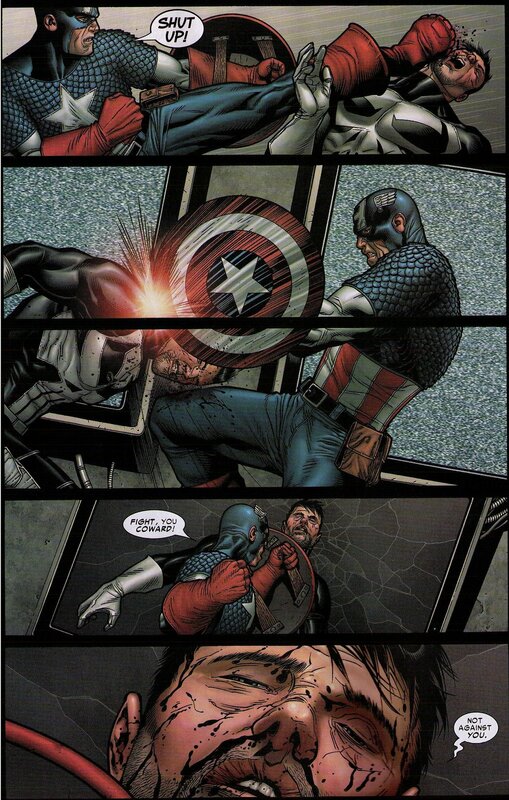 It’s really incumbent on the writers to humanize Cap, and some have done that better than others. In reading Ed Brubaker’s work and the Civil War stories, I see a well-rounded, likable Captain America. Anyone who criticizes Cap as being a dull penny or a pretentious jerk should actually be criticizing the storytelling for that particular arc or novel. I think that’s why so many people hate Cap in Avengers vs. X-Men but love him in Civil War. Put him in the hands of a good writer, and you get something magical. 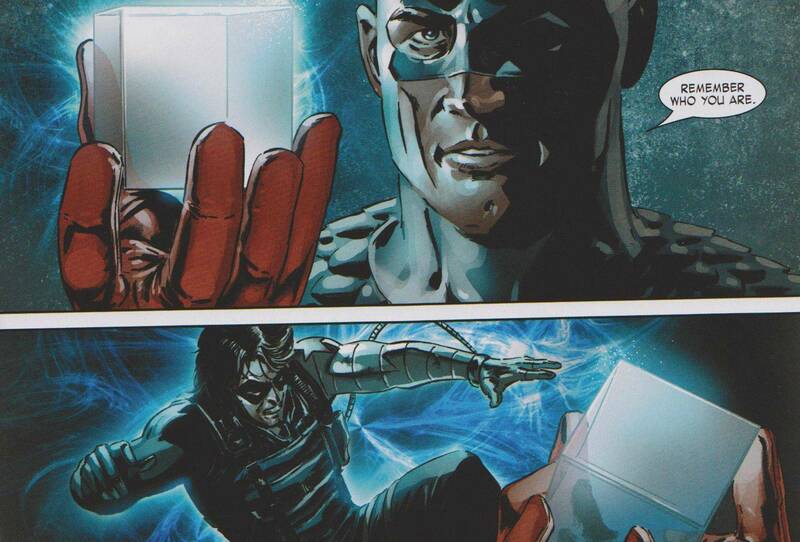 Reading Winter Soldier lately, I’ve related to the man who is Captain America, Steve Rogers — the first Cap. He feels displaced and homesick for a completely different time period — his real home — that he can never go back to. He grieves for his best friend and, for a time, even worries that he might be losing his grip on reality. That’s what I want to know more about. I like learning about the human character rather than just the Captain. That’s why when Cap takes a sweeping action, I believe it more when it has some root in who Steve is. That’s when he nails it. I feel for his personal ideas rather than the general patriotism, and things get more interesting when stories show Cap as more than just a symbol of American freedom. Or maybe as less than that. I don’t buy the argument that Captain America is perfect all the time. Sure, he has a genuine belief in honesty and justice, as well as a resolve that makes him an inspiring leader. But he’s not always sure of himself, and he makes mistakes like any human. Personally, I love it when he loses it a little. While other superheroes can almost come across like bullies if they savagely beat up someone who isn’t fighting back, when it’s Cap, it feels like a character flaw that humanizes him — and you know there’s an awfully good reason for every punch he throws. It’s for all of these reasons that I don’t find Captain America to be dull or too-perfect or jingoistic. I think he has a clean, simple heroism that makes him worth rooting for, and it doesn’t always have anything to do with America — it’s about standing up for your beliefs no matter what size you are or how big that enemy is. 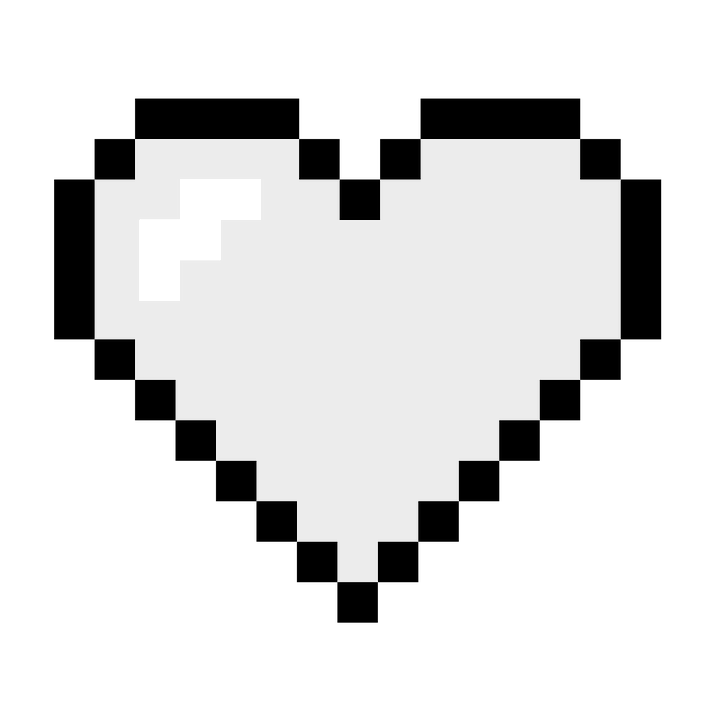 Previous postVote for Your Favorite Geeky Characters All Through March! Very thorough thoughts, A lot of people over look the points you’ve pointed out and they lose sight of who the Cap really is. I like your analysis. Thanks! Yeah, I think being such a symbol of America makes it easy to judge him based solely on that. But reading more about him, you learn all kinds of cool stuff. He’s a very human character, and modern writers have been doing a lot to make him well-rounded and intriguing. I really used to hate the Captain, but the Civil War arc and the movie changed my mind. Especially Civil War showed me that Captain America is about universal ideas rather than patriotic propaganda. Sure, the original hero comes from a time where the America and the world had a common foe (as you also describe in your post), but it is good to see that modern writers do their best to move him away from that old-fashioned origin. The Captain will never ever be my favorite Marvel character, but now I can surely get behind what he stands for without feeling the need to shout out “MURICA!” every five minutes. Yep, I totally agree. He was created in a much different time, so his image as “America” worked back then… but today, that would not go over so well. That’s why I love how modern writers are humanizing him. His Civil War arc definitely made me like him more than ever, too — I saw a totally new side to him there, which was cool. Cap is one of my favorite Marvel characters as well and I can’t wait for the Winter Soldier, where it seems he will be against a lot of what S.H.I.E.L.D is doing or getting ready to do. I can’t wait for the new movie either!! Wasn’t a huge fan of the first even though I liked the overall story — but this one looks like it’s going to be AMAZING. I’m counting the days. Awesome post. I’ve never gotten into comic books, but Captain America: The First Avenger is actually one of my favorites of the Marvel movies (and I like them all quite a bit). Looking forward to The Winter Soldier. Now having said that, before seeing the movie Captain America was definitely a character that I would have had zero interest in simply because I’m not a fan of nationalism and would have viewed the character as propaganda. Yeah, I think that’s how he comes across when you don’t know a lot about him — he did to me, too. I also loved the story and the character from the first film, even though I have to admit it’s not my favorite Marvel movie. Definitely got me interested in Cap, though! Agreed. Cap was ranking fourth or fifth on my list before Civil War, and he hit #1 over that arc. The movies have just made me like him more. Probably the thing which makes him most relatable is his humanity. It’s one thing Marvel’s done really, really well over DC (and I say that as someone who loves both equally). DC, in their major triad, largely went with character who were more than human, and struggle to try to *be* human. Even Batman has that trouble; Bruce Wayne is *so* very dedicated, *so* very obsessed, that while he is technically human, he doesn’t *humanize*. The Marvel heroes, and particularly Cap, go the other direction; they are ordinary people who have suddenly become more than what they were, and so struggle upwards. But because they start out with ordinary origins (and Cap and, to some degree, Spiderman) more than most, it’s easier to identify with the characters. Also, it makes them far easier to write. I know the argument is it’s not the character, it’s how she’s written, and I’ll even admit, Marvel’s done very poorly with a lot of their female characters. But I’ve got a pretty good idea of what I think a strong female character is, and it goes far beyond the ability to throw people across a room. I guess I want someone who’s got the same strength of character Cap has, and she just doesn’t. Peggy did. Some of his other girlfriends have come close. But not Sharon. I’m not denying chemistry, but I’ve never been certain they actually saw each *other*, if that makes sense. Sharon reminded Cap of Peggy (which is not exactly healthy) and Sharon knew *of* him before she knew him, and I’ve never been certain that hasn’t gotten in the way, too. And, I admit, I hate mind control, and mostly, as a woman myself, hate mind controlled female characters. I was okay with it in the Avengers because a) essentially a god and b) an immensely powerful artifact. *Plus*, at least in Selvig’s case, there was resistance. With all respect, I’d rather see Cap with about any other girlfriend he’s had; I especially liked Bernie Rosenthal. I wish they’d pair him with some character who was loyal to him first, SHIELD second, for a change. And, in the MCU, I’d give anything if they could do a make it right and bring Peggy back, but…I know, I know. I was *really* hoping Sharon/Agent 13 would just blow me away in the movies; hell, above all, I’d like to see Cap happy. He certainly deserves to be. I was really disappointed she didn’t impress me a bit in the movie, either. I was more impressed by the geeky tech who refused to launch the carriers. Unlike Agent 13, he wasn’t armed and he had a gun to his head. *That* was some serious going against Milgram’s experiments. Sharon didn’t act until *he* said no, in fact. I was more impressed by *Natasha*, even if she’s Cap’s diametric opposite in some ways. That said, I have not read the Brubaker Winter Soldier run, although I plan to do so if I can get hold of it. It’s just going to take a LOT for me to forgive the ‘betraying Cap, assassinating Cap, stabbing the baby and then killing the foster son’ bit, and frankly, probably more than I can do. Love your analyses, though. Thank you! Yes, I agree with you about Sharon in the movie. She didn’t impress me much either, but I think they just under-utilized her. I also liked the dude at the end who didn’t launch the missiles — that was a great moment, and it’s too bad Sharon didn’t have as much character development as him considering she is a long-term character! I also agree that Marvel does a great job at humanizing characters. That’s a great way to put it. I hadn’t really thought about how DC humanizes characters vs how Marvel does it, but your analysis makes a lot of sense to me. To me, DC superheroes have often felt darker or more epic — sometimes both — whereas Marvel heroes are a little more relatable. Even a character like Thor! That being said, I love Cap the most for being one of the most down-to-earth yet good-hearted “superheroes”. I agree with you that he feels very human. And his origin story is just my favorite ever!